The post title might be a teensy bit melodramatic, but I wish it were more for effect than it is. I’ll try to briefly explain. If you have written a book and not yet been published, or you self published, please stick with me. Learn from my pain, I beg of you. I finished the first draft of my novel at the end of last September. I sent it to my first round of beta readers and immediately started on book two. The book two draft was done in January, and I’m almost done with three. All of these novels are in the hands of at least one beta reader, and the first one has now been read by about ten people. With each new reader, I’ve received helpful feedback, which I’ve implemented. I also hired a friend who was an English major to help me whip my grammar into shape. I read Yagoda’s and Strunk and White’s style manuals and spent weeks hunting down adverbs and killing them. I really felt like the manuscript for the first novel, at least, was in good shape. I wrote an agent query letter that I felt confident about and thought in a week or two I would have the novel polished enough to send it. This week at the library, I was perusing the 808 section to see if there were any other writing books I might like to read. 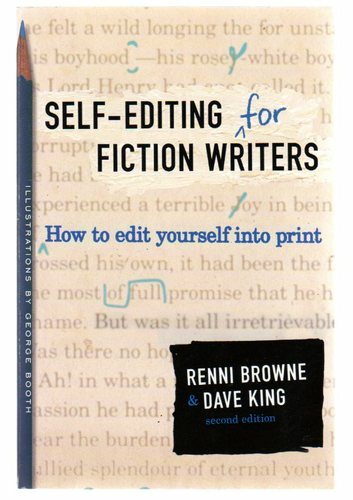 Since I’m revising, I went ahead and checked out Self-Editing for Fiction Writers. I thought there might be a couple of things I might have missed, which I could fix quickly before I sent out my manuscript at the end of July. I read it in less than 24 hours, and then I really wanted to go have a good cry. The book had driven home a very humbling fact: for all the efforts of the previous months, my writing was still amateurish. I realized my manuscript was nowhere close to being ready to send out. I needed to do extensive rewrites–like line-by-line, might be just as easy to start with a fresh Word document, kind of rewriting. My novel has multiple problems, but that’s not the problem. I’ve read extensively about new authors and the common mistakes they make. One that I’ve heard repeatedly is that new authors often think they are the exception. Wrong. My first draft was crap. Did it have a lot of potential? Yes. Did it have the makings of a great story with interesting characters? Yes. Was it still crap? Absolutely. Was I an exception? Nope. I needed to assume that I was like every other newbie author and that I was going to make every newbie author mistake. If I think I know what I’m doing, I probably don’t. However, if I assume I’m an idiot and research everything, I might get this right. After my biggest problem dawned on me, I realized I had a second one that had contributed to the first. Who was I getting my information from? When making decisions on how to edit, whose advice had I taken? My readers’, which is fine–I needed that. Then I had consulted other writers, both those just starting out and the books of those who had been in the game a long time. Again, this probably didn’t hurt. Plus, I had my English major friend, right? She was great for grammar, but she had never edited fiction before, only academic work, and that’s a whole different ballgame. So whose expertise hadn’t I consulted about editing fiction? A fiction editor. Sure, I’d read On Writing. Who hasn’t heard of Stephen King? Have you heard of Browne & King? No. Well, let me tell you about them. Renni Browne and Dave King are both professional editors of fiction whose combined years in editing exceed my age. They wrote a book that chapter by chapter, page by page ruined me. They opened my eyes to the problem, but they also told me how to fix it. I hope one day I can meet them. No, not to punch them, no matter tempting that was a couple days ago. I want to thank them for challenging me to be a better writer. Buy the book. Read it. Cry. Revise. Certainly. It’s nice to not feel alone in my mistakes. There was probably a time (long ago) when if you could just get your manuscript into the hands of an agent or editor, you were ok, assuming the story was a good one. Now with so many thousands clamoring to get published each year, our writing has to be perfect just to receive a rejection. I have completed stories that have been finished for years and I just get tired of rewriting/revising…so they sit unfinished as I try to move forward with something else. Chris, I can appreciate that. I thought for a bit about abandoning my project and starting over. I finally decided I need to learn how to do this anyway, so I might as well learn how to do it on the current project. Even so, I acknowledge that this first trilogy may never get published and just be a learning experience for what I write next. Therein lies the problem…we write learning experience after learning experience?